I can’t describe Sunday mornings in Goa without mentioning the many disappearing acts my father would pull throughout the day. We would find ourselves awaken to “time to go to church”, that mostly sounded like my mother or Gayle, whichever one of them roused first. By the time 1 woman and 3 girls had their turns in front of the mirror that sat over the sink (stay down frizzy hair! ), my dad would be pacing. “Why couldn’t you keep your clothes ready the previous night?” I don’t know? Because we’re teenagers and this is our rebellion? Soon enough (never), he learnt that it was okay to let us be late because he could just go to church on his own. After the last prayers were said, he would get back on his Batmobile, dash back home and start making breakfast. As soon as we walked through the door and offered to help, he would scold us for not changing: “You’ll dirty your clothes.” Breakfast was eaten and he left for the market as soon as he was done. Then we would wait for the sound of his honking from up the slope letting us know we had to come help. Bags of fresh fish, chicken, vegetables, other meats – everything piled up on the kitchen counter-top. He would run with the fish bags to avoid tracking the water all over the floor. Those would go straight into the sink. My mother and he would spend the next few hours standing over the sink cleaning fish, shelling prawns and bagging it all for the long winter. That’s a half joke. I meant the freezer. He would speak of all the bargains, whom he saw and repeat conversations as if they had just happened. I might have helped once or twice in my life, giving up at the part where I had to pull out fish guts. That’s where we learnt the trick to getting the smell of fish out of our hands, those glorious pre-Internet hack days. When I was in Goa last time, I went with him to the market. I just wanted to be there to see him in his element. He knew everyone. He had an order. He shook one man’s hand, went to someone else for chicken, asked another about the price of ginger, went back to pick up his meat, then asked me what I wanted. I muttered something about herbs (lame, I know) and he told me that we would have to walk to the other side. That guy was “my friend”, he said. While I stood there, he told them I was living in America and some other things he tells even strangers about his daughters out of pride. The Joe Banana heir was there talking about his trip to the Sunburn music festival. They made some small talk, joked about other people and I picked out broccoli (SO LAME! I know!) and herbs. Before we left, we went to a few other vendors for the essentials and he asked me if I wanted anything else. Only tambdi bhaji. So he found me a lady that was selling it. 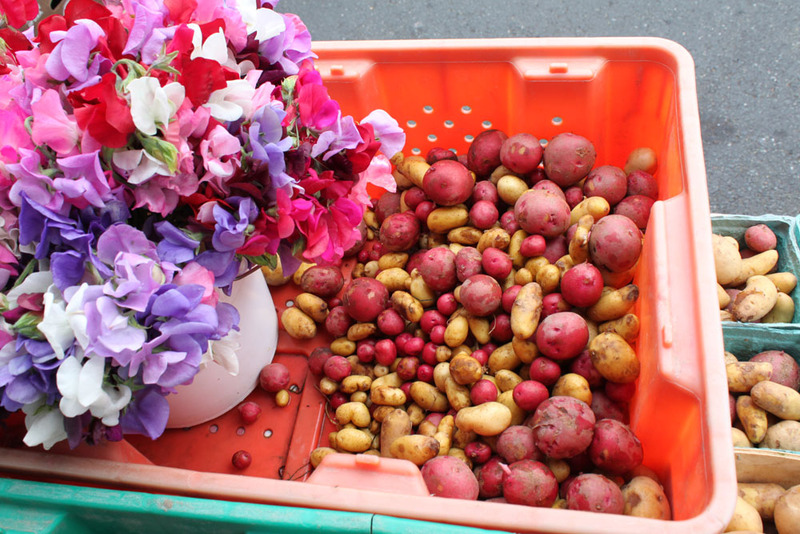 I picked a bunch, she wrapped it in newspaper, and we went home. It’s only now as I sit here and type it all out that I realise how monumental that memory is. My middle-class father has a way of making and keeping good friends no matter how successful he’s seen his life become. He doesn’t have that absurd sense of entitlement. I already knew this. Sometimes it’s just nice to see it play out. There’s a reason why he can walk into Mapusa market and feel completely at home. I can’t do that yet. I’m not sure it’s even an easy task, but I’d like to try. Since May, I’ve been going to the Sunday farmer’s market here in Everett, WA and in that short time, I can comfortably wave hi to people. I know some of their names and I’m working on getting to know the others. We talk about food and in a way, they are my friends. It’s taken time, conversations and yes, more time. I realise that the more honest I am with myself, the better I can be with people. The more I let them in, the more they reward me with truths about how simple life can be. Maybe I always knew this, but I appreciate the hints nonetheless. Unlike my dad, I’m not much of a talker. Like him, I love food. He’s the person that created a pasta salad that showed me how much I really love mayonnaise. Before that, who even knew what mayonnaise was?! His Sunday market trips mean more than just a rush to get to church on time. There are layers of stories that take me years to put together. Sometimes I learn only after I write it all down. I saw it first hand and I copy it in my own way, from talking to strangers to squeezing lime juice on my fingers to get rid of the fishy smell. That’s the trick. It’s so good to know. I love potato salad. I love the sweet, sour and softness of each bite that just tastes like comfort. But when the weather gets hot, we like to keep things light. 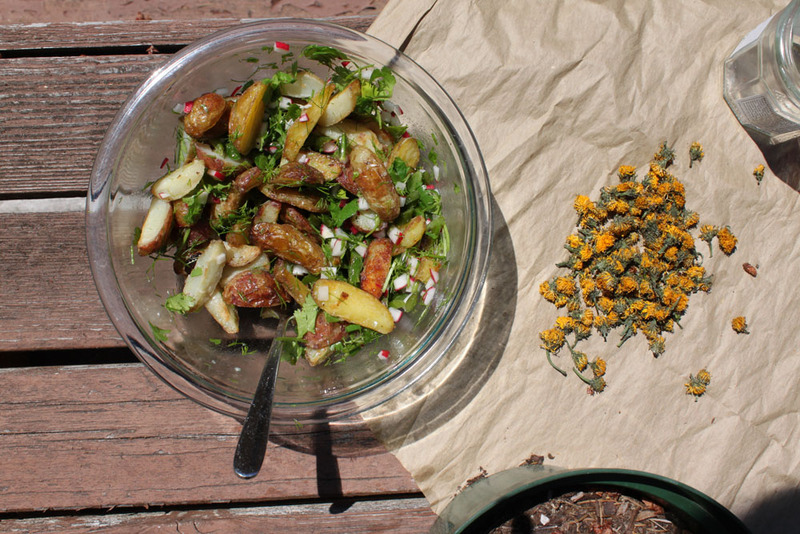 The addition of herbs and radishes makes it so. 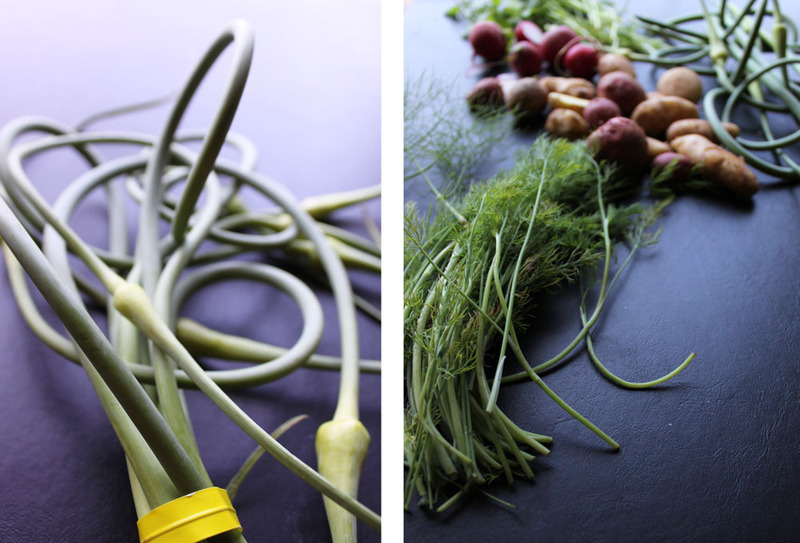 The tender cooked garlic scapes give it a sort of pickle-y, crunchy taste, while adding my favourite garlic-flavour to it all. 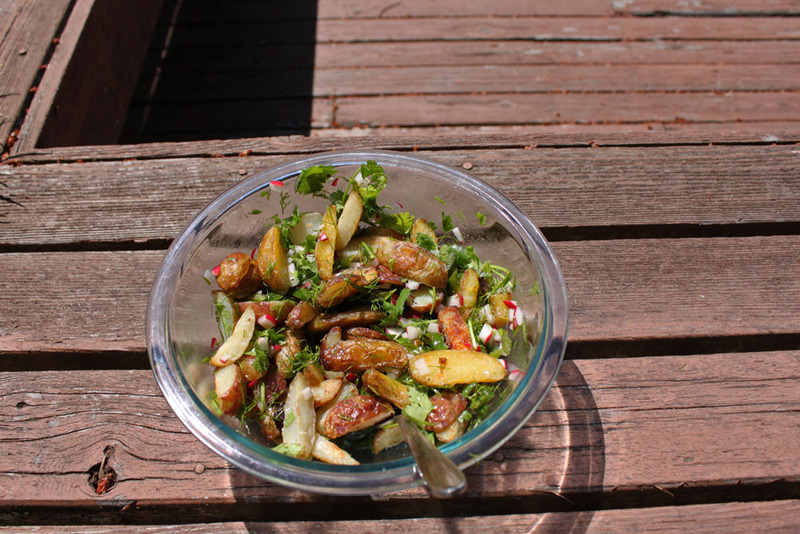 When I made this potato salad, I was thinking of ways to keep mayonnaise in it without smothering everything else. 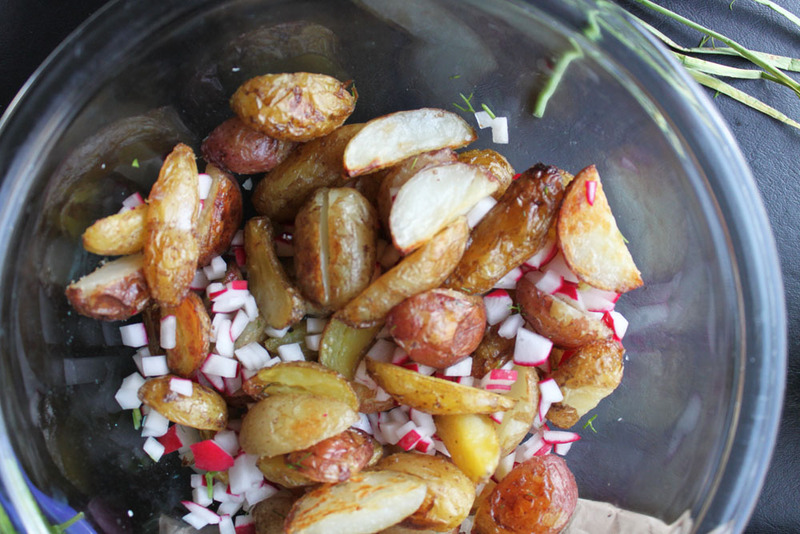 If you want to leave the mayonnaise out, toss the potatoes with olive oil before roasting them in the oven. You can also sub the mayo for buttermilk or yogurt in the dressing. Heat the oven to 400F. Line a baking sheet with foil and set aside. 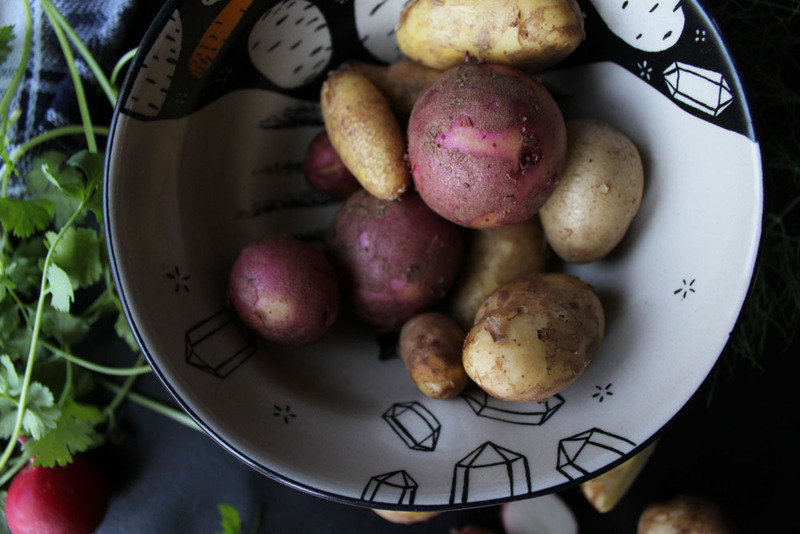 Place the potatoes in a medium saucepan and cover with water. Add salt to the water and bring it to a boil over medium-high heat. Reduce the heat to a quick simmer and cook the potatoes until they are barely fork tender. This should take 5-10 minutes. Once the potatoes are cooked, drain out the cooking water and spray them down with cold water for 15 seconds. 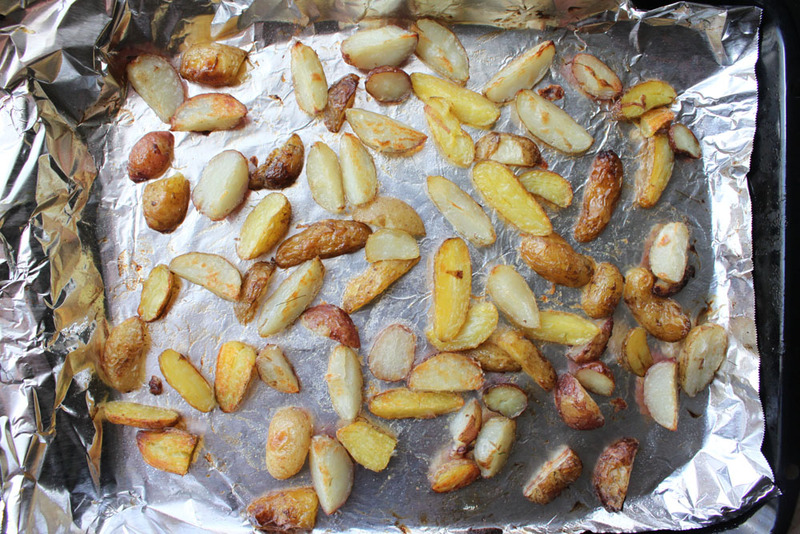 Cut the potatoes into quarters (if they are bigger) or halves and place them on the baking sheet in a pile. Spoon the mayonnaise over them and toss gently with your hands to coat evenly. Spread out the potatoes into an even layer on the baking sheet and roast in the oven for 30 minutes, flipping some of them mid-way to get them evenly crisp (this can take a while so I just flip whatever I can, as fast as I can, not letting it take longer than a minute). They are done when they have a golden-brown colour and are crisp on the outside and soft on the inside. While the potatoes are cooking, heat olive oil in a large skillet on medium-high heat. Once the oil is ready, add the garlic scapes to it whole. Saute them in the oil until tender and the skin is browned in parts, for about 5-10 minutes. Season lightly with salt and pepper and take it off the heat. 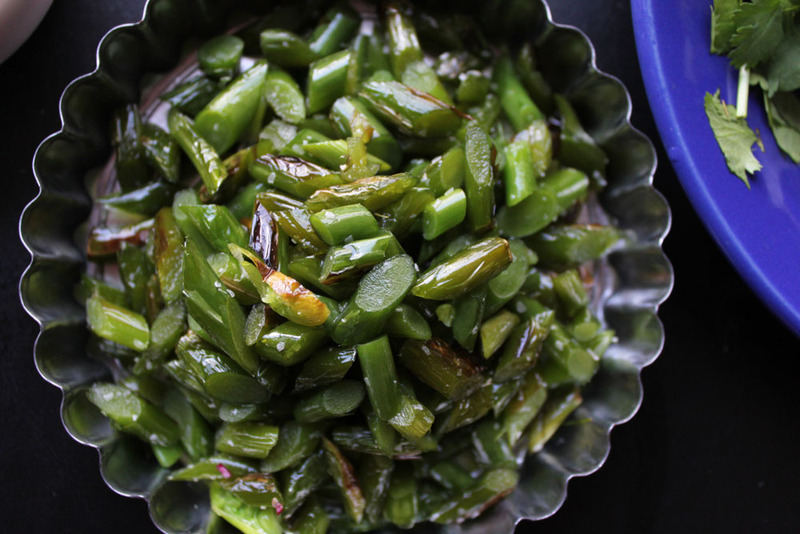 After letting them cool, chop the scapes diagonally in 1/4 inch segments. Whisk together all the ingredients for the dressing and add salt and pepper to taste.. When the potatoes are ready, take them out of the oven and let them cool for a few minutes so they crisp up. Put them in a bowl and then spoon a small amount (about a tablespoon) of the dressing over them. 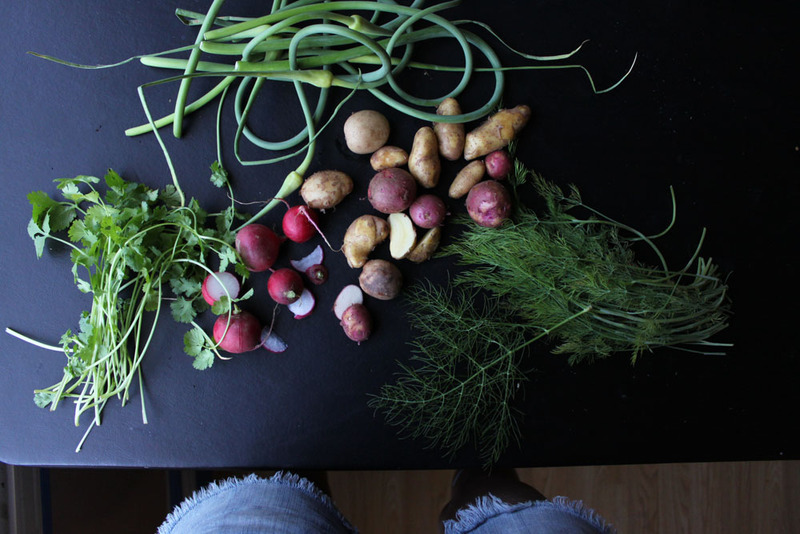 Add the scapes, radish and all the fresh herbs to the bowl and toss gently. Add more dressing just before serving and sprinkle the raisins on top. That’s very sweet! Dads are the best. Mine does most of the cooking at home and lets my mother do it sometimes (rarely without complaining about something or the other). He’s very proud of how good of a cook he is and is very control-freakish in the kitchen. It’s best to stay away when he’s cooking. I feel the same way when I cook sometimes, which is so weird.